This week long adventure holiday in Cuba is for anyone wishing to explore in the company of other like minded and similar aged travellers. Becoming part of a group is a great way to build confidence and get a deeper understanding of the locations that you’re visiting. Places like: Havana, Vinales, Maria la Gorda and Las Terrazas. 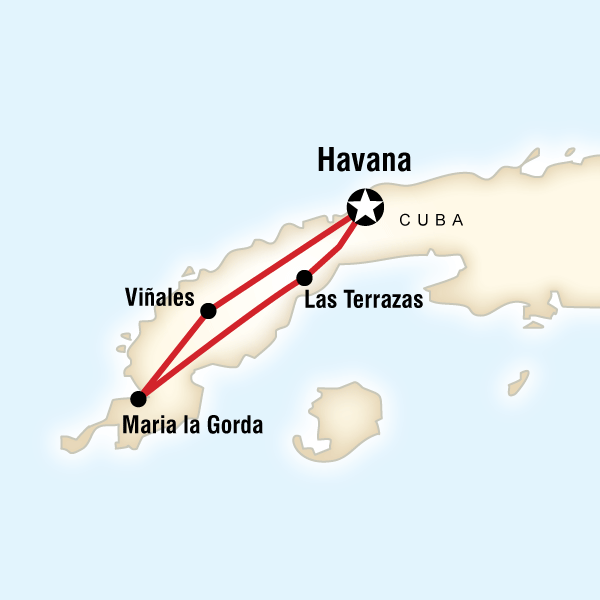 This particular eight day itinerary focuses on Cuba’s western shores, more commonly known as the Garden Province. This is where vast fertile hillsides have been turned over to the cultivation of coffee and tobacco alongside luscious valley slopes peppered with brightly coloured orchids. Head to the Guanahacabibes Peninsula, and it’s tales of piracy that capture the imagination as you snorkel over coral reefs on the lookout for tropical fish and pilfered plunder. Led by a knowledgeable group leader, you’ll be invited to soak up the Caribbean sunshine as well as Cuba’s cultural heritage as you spend a night in a rural homestay and continue to explore way off the typical tourist radar. This is a great tour for travellers looking for the security and affordability of group travel but without the crowds associated with Cuba's tourist hot spots. Las Terrazas started as a reforestation project and was later declared Cuba’s first UNESCO-sanctioned biosphere reserve. Today it is an ecotourism resort providing employment for the local community. On this tour you may have the opportunity to visit a local bike workshop in Old Havana developed by BICYCLES CROSSING BORDERS (BCB), a non-profit organization that promotes cycling by shipping unused and repairable bikes to Cuba. BCB has trained up to 30 Cubans in bicycle repair and maintenance, the majority being women and encourages more Cubans to set up efficient bike shops across the island. We support this project through our non-profit organization, the Planeterra Foundation. Las Terrazas is beautiful and interesting. Our group did a death ride there (optional) and that was a lot of fun. The beach and resort at María la Gorda is just like heaven: sit back, drink a mojito and enjoy the beautiful sea. Horseback riding in the beautiful scenery of Viñales is one of the most exciting activities. particulares. Here you are among local Cubans and in just walking distance from the center. Yes. We learned a lot about Cuban Society and government. This is a really basic trip and accommodation is poor. The home stay part definitely benefitted the local communities. Poor - I wouldn't recommend this trip. It didn't live up to my expectations one bit. I was sorry to hear that your were disappointed in your recent experience with us in Cuba. We do take client feedback seriously and if you would like to reach out to us directly we would be happy to look into your concerns. Horse-back riding and galloping through the fields and valley of Vinales. hard to buy anything essential out there. We went to see the Buena Vista Social Club in Havana - these musicians were amazing and the whole club was jumping. Cruising in the 1950's cars was absolutely amazing - this is a must in Havana!!! Also loved the horseback riding in Vinales - Che's monument - Trinidad was fun, lots of music/salsa dancing there. If you can, try and add a couple of days at the end of the trip to take in Old Havana - there is just too much to see and not enough time to do it in! All of our group seemed to be very generous/considerate of the local people. Some people came with toiletries and stationery to give to children. I had a great time and would recommend it - there was just too much to fit in 9 days! The most interesting place on this tour was Trinidad. It had a lovely, chilled atmosphere and was a well maintained city, where the people were friendly. This compared quite considerably to other towns in Cuba that I visited such as Santiago, Santa Clara and even Havana, where the people were hassly and the town was not particularly well cared for. A brilliant restaurant in Plaza Vieja, called Santo Angel, which I would recommend to any other visitor to Cuba. A meal with actual flavour! This tour was much more enjoyable overall than Cuba Colonial, as it was more small town and countryside based. The scenery in the western part of the island is beautiful and the places visited were all very welcoming with lots of options for good things to do. Expect to wait a long time for anything to be done by Cubans. Relax into the flow and it will be enjoyable, if you keep expecting you'll just get frustrated. Cuba is a very interesting country where visitors face many difficulties, so as a traditional holiday destination it is not ideal. Not particularly. The guides and drivers were local, but since everything is so restricted in Cuba then the impact on real people rather than those in the tourist industry was negligible. The experience is very dependent on the tour guide, so overall I preferred the Cuba Libre tour to the Cuba Colonial tour. We really fell in love with Cuba. The tour served perfectly as an introduction. I only wish I had had more time to take the two week trip that included eastern Cuba as well. Cuba is difficult for a vegetarian, rice and beans was about all that was on offer for us. Fortunately I like rice and beans. As for the impact on locals, I think it was minimum simply because we did not stay anyway long enough to make any positive or negative impact. Old Havana was the highlight of the tour. We spent an extra few days walking around it, admiring the architecture, the museums, the music and life in the alleyways. Horse riding across country to get to a waterfall for a swim. The guys that organised it were extremely friendly. We knew it was going to be amazing when they sent a horse and carriage to pick us up, and it just got better from there. Also, on Islas de los Iguanas, having an iguana come scurrying towards my camera for a close-up rather than scurrying away from it like most of its mates. As with all trips to Cuba, ensure you take absolutely everything you are going to need while you are there, ie don't assume you can pick up anything you have forgotten when you get there as shopping is extremely limited. Also, the locals, especially those further away from the towns will appreciate any pens, toiletries, old clothes/shoes you can give them. In most places we stayed in Casa Particulares (what we would probably call B&B's) and mostly ate in these or in paladares, all benefitting the local economy. Environment? Well, the bus we used for most of our travel wasn't very good for my environment (fuel fumes inside the vehicle) so I can't imagine it was particularly good for Cuba's either but then in Cuba, all things are relative!! !